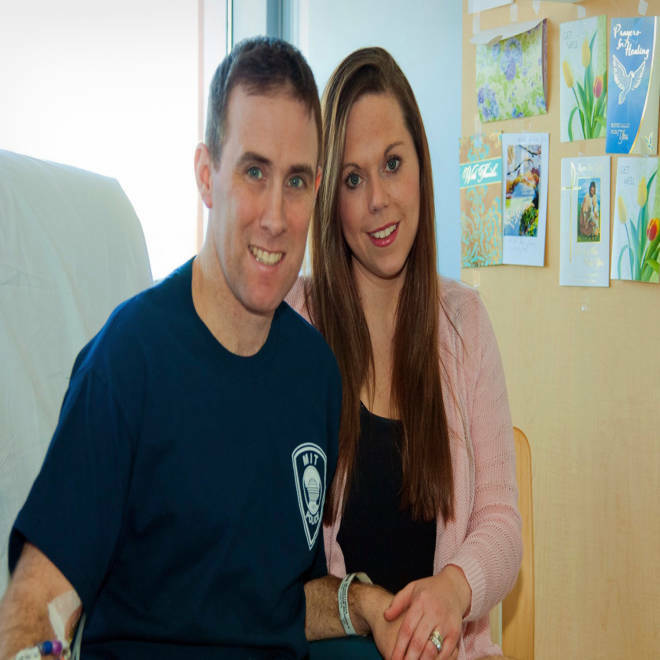 MBTA transit police officer Richard Donohue Jr. Is shown with his wife Kim, in this handout photo from May 1. Donohue is recovering from injuries suffered in a shootout with two Boston Marathon bombing suspects. A transit police officer wounded in a firefight with suspects in the Boston Marathon bombings made his first public statements Wednesday, crediting a slain MIT officer for saving his life, and revealing that a bullet from the shootout will remain lodged in his leg. In a message posted on the MBTA Transit Police website, Richard "Dic" Donohue thanked those involved in his recovery. Donohue, 33, arrived at the scene soon after MIT campus police officer Sean Collier was shot in Cambridge, Mass. Collier was shot multiple times in his squad car, police say. Donahue credited Collier, who later died in the hospital, for saving his life. Donohue said he still has a long way to go in his recovery but said he is able to briefly move around with the aid of a walker. Tamerlan Tsarnaev, 26, one of the suspects in the marathon bombings and the killing of Collier, died in a firefight with officers in Watertown, Mass. His brother, 19-year-old Dzhokhar Tsarnaev, is charged with federal terrorism charges for the April 15 marathon bombings.